It had been far too long since I last set foot in New Orleans. In fact, the last time was during the ice storm last February. The roads may have been perilous, my windshield may have had a solid sheet of ice on the edges, but I was determined to return to Jackson with king cakes and I did. Fortunately, the weather in October was much more accommodating. The lingering heat of the summer had finally moved on and it was that glorious time of year where you can stand outside and not turn into a wrinkly, sweating mess. Aside from enjoying the weather, I had made an early break from Jackson to ensure I’d hit New Orleans in time for lunch, but not just any lunch; after months, maybe years of procrastinating, I was finally heading to Jefferson Highway for a taste of Crabby Jack’s. I say months and years because I’ve been relying on the recommendations of a few Jackson and New Orleans residents for my past po-boy pursuits, namely Nola Maven and the good people at Blackened Out. 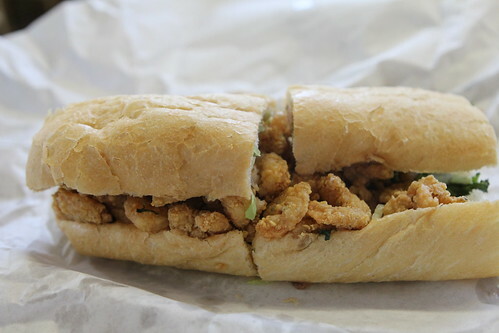 I’ve been slowly making the rounds of some more well-known po-boy vendors but the suggestion of Crabby Jack’s would always gnaw at the back of my mind. Well, enough was enough. With an empty stomach and a camera in hand, I was determined to see if Crabby Jack’s was worth the wait and effort. As with most po-boy restaurants, I had to make a decision. Do I try some of my favorites, my litmus tests or do I strike out and sample a house specialty? 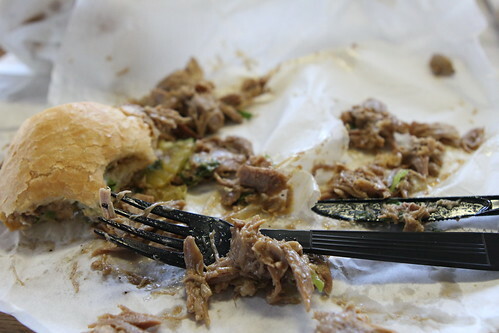 This time, the later won out as the roast beef po-boy and oyster po-boys went unordered. 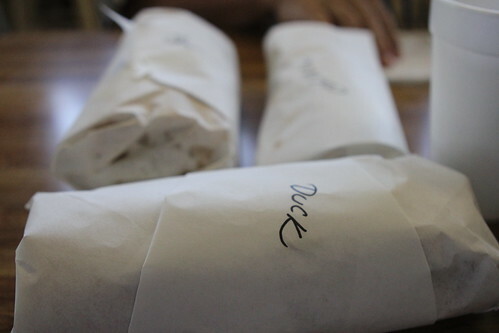 What did appear was a duck po-boy. The first of three for lunch, I had barely undone the tape when the full-bodied aroma of well-cooked duck hit me. 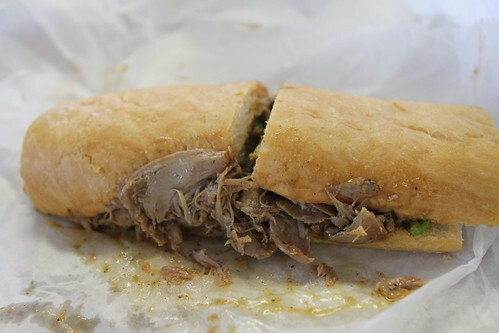 There it was, a po-boy overflowing with moist, thinly sliced duck. From the first bite, I kicked myself for not eating here sooner. Each mouthful was brimming with silky duck, the briny snap of pickles, and gravy with just a touch of pepper. It was a staggering amount of duck for $9, and it was so rich and succulent that I was initially convinced I had been given pork by accident. This would hardly be a po-boy outing without a little bit of fried food, luckily a helping of fried shrimp on Leidenheimer bread filled that void. At first glance, it was echoes of Parkway Bakery. The shrimp were on the smallish side but plentiful enough to overflow from the loaf with the slightest touch. Quantity aside, the quality of these shrimp was equally impressive. Each shrimp tail carried a satisfying crunch with a salty crust and an ever so slightly briny meat. 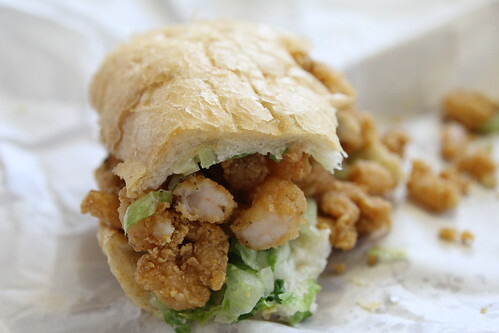 Topped with a few shots of hot sauce, this shrimp po-boy became a loaf of fried seafood bliss. 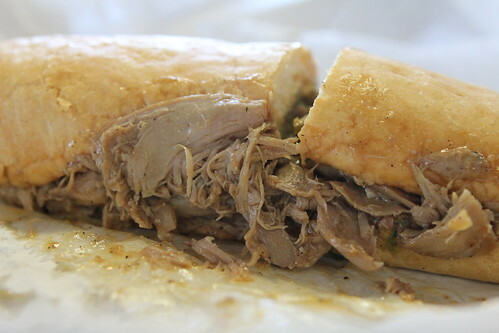 Never one to be easily satisfied, I decided to overindulge and round out my trio of po-boys with a little bit of cochon de lait. Since I started writing this blog, I’ve had my fair share of excellent and flat out terrible pork. 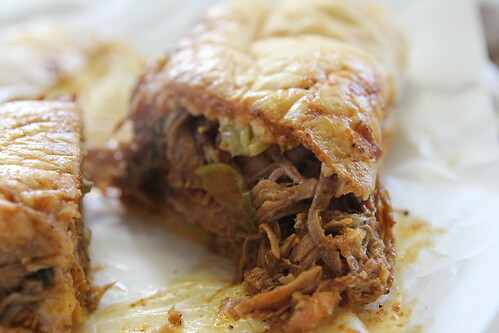 I’m afraid that this po-boy puts damn near everything else to shame. 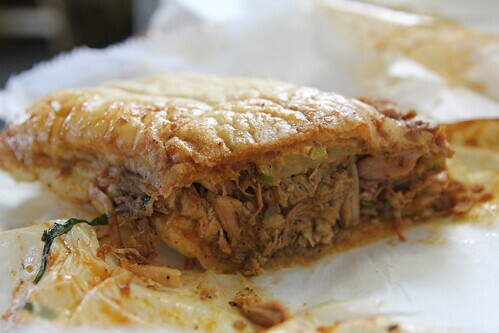 Between the soggy slices of po-boy bread lay a small mountain of ethereal pork. Silky and unctuous with a slight spice of a rub; there was no real smokiness, just the vinegary crunch of pickles to help cut through the pure pork flavor, fat, and sweetness. It’s not often that you encounter a dish that makes you reevaluate your take on food, but hyperbole aside, it’s hard to imagine a higher pinnacle for the humble suckling pig. Conquered by a trio of po-boys, I could only ponder why I had procrastinated so much in coming to Crabby Jack’s. 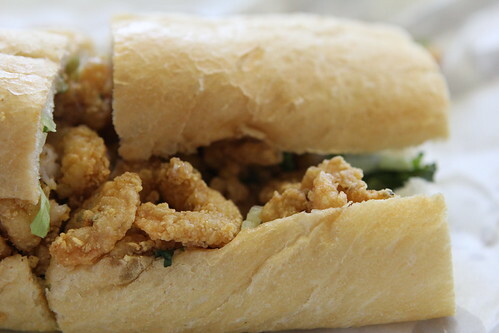 In retrospect, what was really unfair about the whole venture was the shrimp po-boy. It’s a perfectly fine sandwich, certainly above average, but it didn’t stand a chance in comparing to the cochon de lait and duck po-boys. Later while wandering through the rest of New Orleans, I was told all the excellent po-boys I had missed on the Crabby Jack’s menu. Undoubtedly, Crabby Jack’s deserves multiple visits. 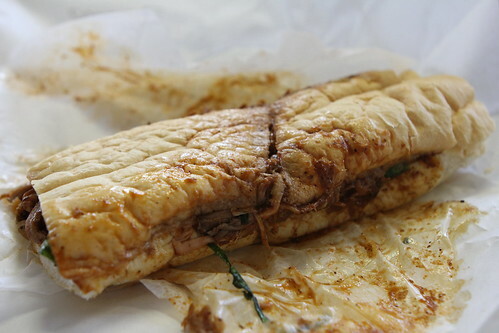 It’s a shame that so many visitors to New Orleans will never make it here, but true po-boy fans will hire a taxi, rent a car, or walk to get these po-boys. They truly are that spectacular. Dude, I love this post - I'm returning to Jackson soon, and then heading to New Orleans for a quick visit. Your posts are up at an impeccable time. Perhaps we will have to meet for a meal if time allows.